Rick and I met when he left his previous job early and the construction was late. He was joined by Brian Farr, the eventual Station Manager and Ken Day later to be the Sports Director. None were independently wealthy hence when they were offered the opportunity to get a paycheck by working on construction they all agreed. Rick was very approachable when I would engage him about becoming a DJ. I think he was instrumental in me replacing the All Night Man when he was fired. I recall him [on air] being crisp and concise, economical with his words... This was my first job in Radio therefore he was my Benchmark [as a PD]. When I read Ron Routh's page on your site and spoke with him I was blown away with his fond memories of my dad (Rick). He described to me the way my dad would be talking to you and close his eyes as he would finish a sentence.... little micro impressions that have endured in Ron's mind for 40 years. So awesome! First, I feel I need to set the stage in a way to show how my father grew up. Rick was born in Hamilton Ontario on May 30 1944. His parents were Dr Cameron Adams (DDS) and his wife Betty. He had one older brother John. The Adams family (my family) are a branch of one of the oldest families in Canada with a lineage as "cousins" to the presidents of the United States, John Adams and John Quincy Adams. After our family immigrated to Canada, in the late 1700's, my third great grandfather the Reverend Ezra Adams built the Town of Acton, Ontario in 1840 and the town of Drayton by the 1870s. Ezra's youngest son was a man named John Gennings Curtis Adams who became a world known dentist out of Toronto. Indeed he did such great work in that field that he has gone down in the history books as the Father of Modern Dentistry in Canada. My grandfather Cameron was the youngest of 9 children and all of them became doctors of dentistry. So, you can imagine that the environment that Rick lived in as a boy was of high expectations to follow in the footsteps of our fathers and continue the family tradition of dentistry ... but most of all ... to be a leader and carry on the family name with achievement. Rick however was different ... he was raised with old school ideals and all that but was not satisfied with the whole idea and craved a more creative contemporary life. In some sense he became the black sheep of the family if you will... while his older brother John engaged in the learning of the family business. Rick was more of a loner who thrived on social dynamics. His nature was laid back and open minded. He loved the written word: reading and writing. He wrote poetry and was highly intellectual. During conversations I've had with some of his old friends they've told me that he was a very kind and sincere person. You really knew that he was listening to you. He had a extremely compassionate and caring side to him that put you at ease right away. And he was just a fun guy to be around! Rick was highly creative at just about anything he did. He could sit at the piano for hours composing music from scratch. He was a wonderful player. He liked to build and refurbish furniture and make furniture. He also loved food and loved to cook. A childhood friend of Rick's when he was growing up was a young, soon to be well known broadcaster, Peter Jennings. They did some early broadcasting training together, most probably at CHCH-TV. 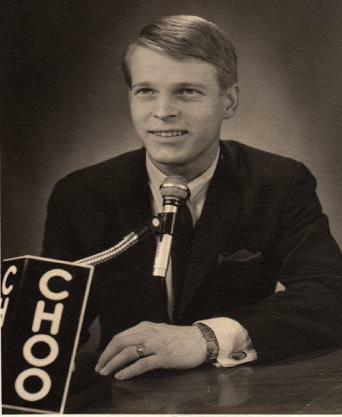 While Rick was at CHCH-TV in Hamilton, Ontario, he gained some notable recognition for his creative writing [circa mid 1960s] winning a Bell Ringer Award for a Carnation Milk commercial he had helped produce. By the time Rick was at CHOO before its on air launching in 1967 he drove a big ol ' 1964 Pontiac custom sport Pariesian, glossy white with red leather interior. He had to look the part, ha! Rick was driven both professionally and creatively. He had a passion to be a good broadcaster. I think he loved his time at CHOO Radio and enjoyed the opportunities it provided him. This is the one and only story I know about him at CHOO: He had come up with a programme that covered Expo 1967. During one segment there were interviews with various artists performing there. My mother was one of them! (My mother's family at the time was living in Pickering.) When she met my dad she was a makeup artist who was helping out with a local high school play at Expo. Dad interviewed her on the air. I only wish I could hear that tape! So in a way I guess you could say thanks to CHOO that's how my family started! By 1969 Rick packed his car, said goodbye to CHOO as well as his family and friends in Ontario and headed west to meet my mother in Vancouver. Her family had moved there earlier in that year. Dad loved the outdoors and nature. He liked to fish and hike and just be out in nature. I think the thought of driving across Canada over the Rockies to start a new life in B.C was a real exciting adventure to him. With his credentials, he soon found his place at CHQM in Vancouver in news and as a researcher in their library. That appealed to his other side to his love of broadcasting. He was super keen on the law, politics, psychology and current affairs. While working in the early 1970s at CHQM and later CJJC in Langley, he became a court clerk for the provincial government and later a Justice of the Peace. Back to his love of nature: When living in Abbotsford, out in the Fraser Valley, he would go adventuring out to the nearby mountains. One story from a friend of his to me was about a time he and Rick were doing some seriously amateur rock repeling. Something happened that put my dad in a very bad situation. Hanging by a failing rope over the side of a very steep cliff, my dad's first reaction was of course total fear at the thought of falling to his death. Then he began to laugh hysterically about it, almost making the situation worse! Needless to say he finally regained his composure and pulled himself to safety but not without tears in his eyes from laughing so hard. CJJC was Langley's country station and Rick hosted his show and spun records there. He loved all good music and literature. A favorite book of his was "The Old Man and The Sea," by Ernest Hemingway. After CJJC he moved to CFVR in Chilliwack, BC. I think it was more news and event reporting than music for him there. Rick's radio and media career lasted just over ten years. Sadly my family broke apart in the last years of his broadcasting days. He died many years later on September 6th, 1984 at his home in Prince George, BC at the age of 40. Today he is survived by four sons from various marriages. Thank you Mike Adams for painting a vivid word picture of such a remarkable broadcaster, human being and father. In a way, Rick Adams was also a kind of founding father for all of us who followed in his footsteps at CHOO although we never knew him. We are most grateful to Mike for adding to our knowledge of CHOO's earliest days with these splendid recollections of his dad. Mike, I hope I've created a tribute page to your dad worthy of his name and contributions to CHOO's history. PHOTO (LEFT): Rick up the ladder at 97 McMaster Avenue helping to build a dream - CHOO Radio in 1967. Note writing on the wall: "It's Happening! CHOO." PHOTO (BELOW): Rick Adams at the CHOO mic circa 1967. All photos courtesy Mike Adams. More photos of Rick to come! I am very glad to have had the chance to present the story of two influential CHOO PDs during this update... both only stayed two years each but both had a big, positive impact on those they met! This site is now temporarily "frozen". For recent updates and to post new comments about CHOO 1390 go to our new blog; details on page one. NEW! WELCOME to readers joining us by direct link from the awesome Vancouver Broadcasters site. Enjoy your visit and please feel free to look around using navigation buttons below.